The term “Assisted Living” is the most one of the most Googled senior living search trends. Although aging at home is the preference of many seniors, if there are no family caregivers available and no in-home caregivers, that solitude can be an awful thing. Those who have chosen assisted living report a high degree of satisfaction with their senior living choice. However, Baby Boomers, those born post World War II — between 1946 and 1964, are defining a new way of aging. They are living longer and more actively so it makes sense that they would seek to establish a new kind of senior living dynamic. When living alone and aging in place is no longer a viable or preferred option, they are choosing to age in communities of their own design. Marianne Kilkenny is one such advocate leading the charge in bringing forth a new aging community model. 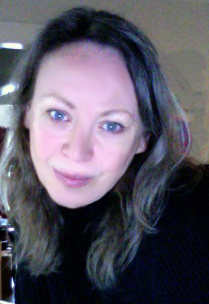 She created and founded Women Living in Community (WLIC) in 2007. What began as a simple website has grown into a movement. WLIC brings together individuals, families, and professionals who are changing the face of senior housing options. The vision is to move from the standard aging elder institutional settings like assisted living housing and nursing homes to communities where neighbors care for each other. 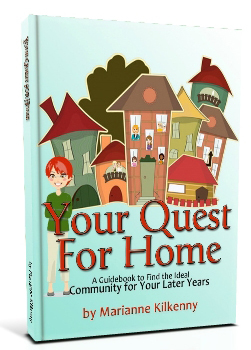 Ms. Kilkenny has also authored Your Quest for Home: A Guidebook to Find the Ideal Community for Your Later Years. The workbook details the options for resident-created communities that might include co-housing and “pocket communities” where residents look after each other, care about each other, and support each other. As with all senior living options, there are challenges to the model as well. Traditional assisted living provides planned activities. Unless a resident is proactive about getting yoga instructors to come to a central community location, or hire a van or bus to take groups on cultural outings, those perks won’t be available to those seniors who are unable to get out and enjoy these experiences on their own. More importantly, what sort of medical attention is available onsite? I also think one of the keys to the success of these communities is to make sure they are multi-generational. If everyone in the community is aging together at the same time, how good is your brother’s (or sister’s) keeper when you are both in your 90s and need the same level of attention and help with the activities of daily living? And one of my biggest beefs with institutional aging settings is the age-segregation that naturally occurs. I’ve always liked the idea of a Golden Girls kind of living arrangement where I wind up co-housing and cracking wise with a group of girlfriends (women generally outlive their male spouses.) Of course, these alternate retirement communities are not just for the ladies. NBC Nightly News filmed a shared housing model in Asheville, NC. featuring four women and one “Golden Guy”. What do you think of this alternative to existing assisted living and nursing home models? Do you think this might just be the future of an aging society? What do you think would make this interesting atypical retirement community work even better? This is one of my favorite times of year. 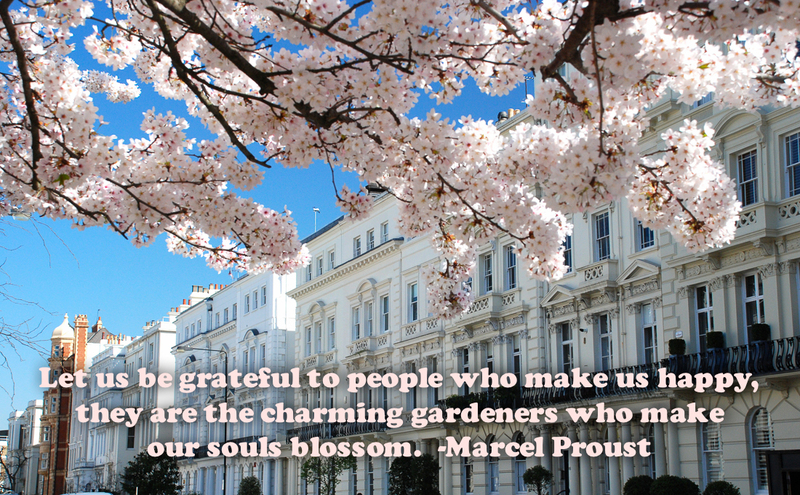 Spring blossoms burst forth and make everything look new and bright. This week's photo was taken in the Notting Hill neighborhood of London, England. 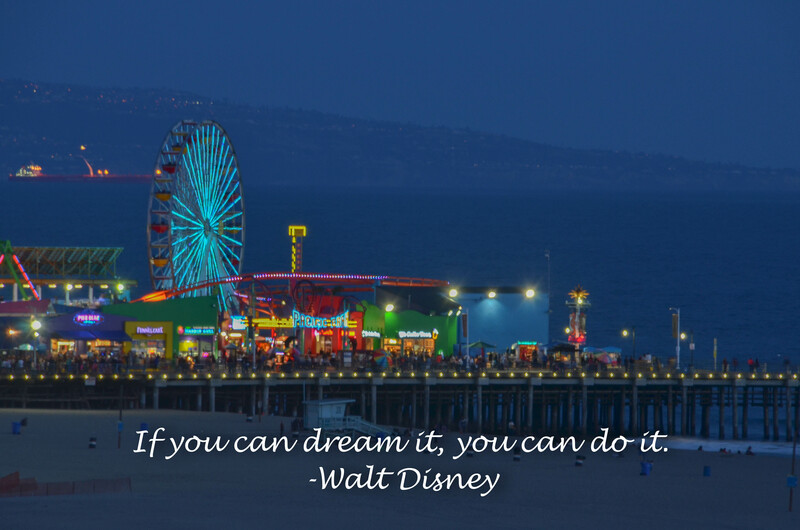 Caregiverlist invites you to take a moment to enjoy the photo and inspirational quote and share it with loved ones. Thank you caregivers and certified nursing aides for caring for our seniors. Senior care training briefs help senior caregivers to understand various senior illnesses and keep up with the latest care techniques to relieve caregiving stress. We hope you can take some time to yourselves and have a great week. For a senior or a senior caregiver, navigating a big city and knowing the fastest way to get from point A to point B can be difficult. With cities becoming more congested than ever, knowing the best form of transportation in real time can help senior caregivers and their clients save time. 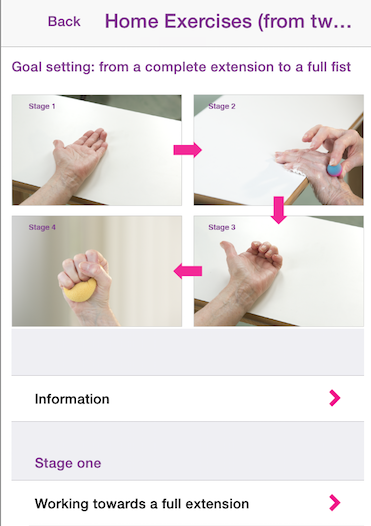 Using the CityMapper app, senior caregivers can see the estimated amount of time it would take to get someplace by walking, riding a bike, taking a cab or using public transportation. When users first open the app, the home screen offers a main function option of "Get Me Somewhere." When users click on this button, the app assumes their start location to be their current location from GPS data and asks for an end location. As soon as users begin typing in the name of their end location, the app searches for it letter by letter for quick results. If users want to start from a different location than their GPS data supplies, all they have to do is type in an address or a landmark. 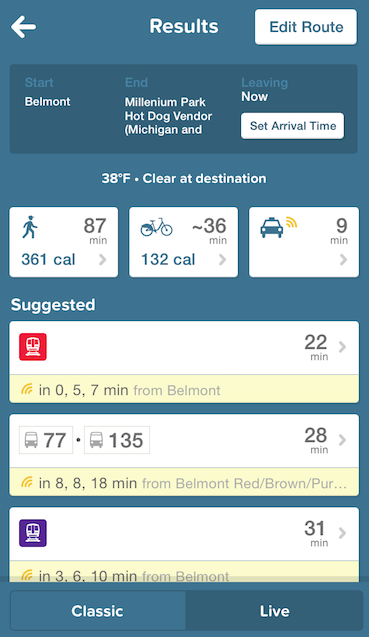 Once users set the start and end points, a "Results" screen pops up with various transportation options. The walking and biking options offer an estimated number of calories to be burned, which can be useful for the caregiver looking to relieve stress and fit some exercise into their schedule. The results appear in Classic mode or Live mode. Classic is best used for planning future trips, such as planning how long it would take to get to the doctor for an appointment tomorrow afternoon or estimating how long it will take to get to an event tomorrow. The Live mode offers real time estimates considering current traffic and bus or train tracking data. Additionally, in the Live tab, the cab option offers real time estimates for the fare cost of riding with nearby Uber drivers. The public transit data in the Live option offers tracking data on the next buses and trains so caregivers know exactly when to leave to catch the next ride on their line. The app even offers a feature that alerts the user when they're nearing their stop so they know when to get off their public transit bus or train. That feature is particularly useful for first time riders of a certain line who might not be familiar with the route. The CityMapper app is available for Apple and Android platforms. Here in Chicago, we awoke on Earth Day to a light dusting of snow on rooftops. This is April in the Midwest. Consider my plans to garden with my mother dashed. But not to worry — there are still plenty of ways to celebrate Earth Day with seniors and support the environment along with its protection. Senior caregivers are always on the lookout for special activities for their care recipients. I’ve culled some great ideas from around the web (along with a few suggestions of my own) and come up with some Earth Day undertakings to commemorate the day. My original plan for today was to plant a tree. There are lots of reasons why planting and maintaining trees are especially good for our environment, not the least of which is that trees can help combat climate change by absorbing carbon dioxide while releasing the oxygen back into the air. Added bonus: trees conserve energy. According to Tree People, three trees placed strategically around a single-family home can cut summer air conditioning needs by up to 50 percent. Today would be an ideal day to go through accumulated stuff — you know, the clothing, appliances and goods that are no longer used and donate them to a worthy group. Just make sure you double-check with family before you schedule a pick-up or drop-off. You don’t want to make the mistake of getting rid of a beloved family heirloom or valuable item. Senior caregivers connect the elderly to their environment every day. A great caregiver will look for opportunities to celebrate special days like Earth Day. Look to your local Areas on Aging for ideas and events to celebrate the health of our planet. A day at an amusement park is a great way to relieve some stress and bring out the kid in all of us. This week's photo was taken in Santa Monica, California. We invite you to take a moment to relax and enjoy the photo and inspirational quote and share it with loved ones. Thank you caregivers and certified nursing aides for your hard work and caring for our seniors. More caregivers are always needed as seniors in America are living longer. You can learn more about becoming a senior caregiver and apply for a job near you. Have a great week. Mother’s Day is fast approaching and there may be people in your household deciding on a gift for mom — some are even treating their mothers early. If you are one of the many American woman who provide essential senior care for an aging parent, care for your own children, and work outside the home, now is the time to start dropping hints about what gifts would rock your May 10. I’ll say it — I think those of us who spend the entire year caring for others deserve at least one day of some thoughtful appreciation. Numbers culled by the Family Caregiver Alliance estimates 33.9 million adult caregivers, or 16 percent of American adults provide unpaid care to a recipient aged 50 and older. That informal care is valued between $148 billion and $188 billion annually and an estimated two-thirds of those family caregivers are female. Mother’s Day is the perfect time for some serious payback. While flowers and jewelry are always appreciated, if asked, consider giving these suggestions for special Mother’s Day gifts. About 75 percent of caregivers who report feeling stressed emotionally, physically, or financially are women. When you are making less at work and spending more at home, the last thing you have is expendable income for movies, plays, or concerts. Those important outings are food for the soul. Tickets or gift cards good for nights out (dinner and a movie? cocktails and the opera?) for two makes a great present. I know spa treatments are are pretty typical Mother’s Day gifts. But how about treatment for two? Mom and grandma can get a home visit from a mobile spas. It's especially decadent as they can bring massages, facials, and mani-pedis right to the home for no muss, no fuss pampering. Spring cleaning for family caregivers might mean cleaning two homes. What would make a great gift? How about a cleaning service, just once, for one or, what the heck? both places! Getting a break from my most tedious, back-breaking, time-consuming job would certainly make it to the best-of-the-best gifts list. Mother’s Day comes and goes and life gets back to it’s usual routine, but a “gift of the month” membership will make someone feel appreciated for 3, 6, and 12 months. The most popular of the gift clubs is the Wine of the Month Club, of course, but there is a Coffee of the Month Club, Cheese of the Month Club, even a Hot Sauce of the Month Club. Gift of the Month Clubs let the recipient know their contributions are acknowledged for more than just one day. Can Somebody Else Do This? Respite care can be for a weekend, a day, or even an hour. Family, friends, or neighbors can certainly provide respite care, but a quality home care agency can provide a fully vetted professional caregiver to step in and relieve some of that caregiver stress and help prevent caregiver burnout by providing support for a senior's Activities of Daily Living. We at Caregiverlist® wish all the mothers and grandmothers out there a happy Mother’s Day. If you have some special gift suggestions, we’d love to hear about them in the comments. Tax day is April 15 and when many low-wage workers look at their year-end W-2 it’s easy to ask, like Rachel (who worked in a coffee shop) did on an early episode of Friends, “Who is FICA, and why is he getting all of my money?” It’s disheartening to open that weekly paycheck to see, after all you hard work, you have barely made enough money to survive. 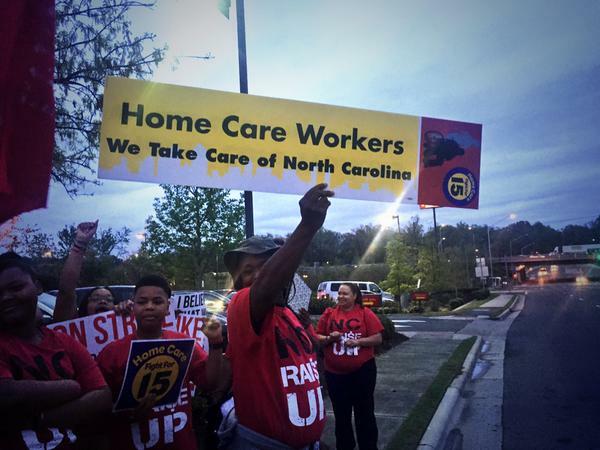 That’s the impetus behind Fight for $15 — the global protest to raise the minimum wage to $15 per hour. Organizers and protesters are using America’s tax day to highlight income inequality. Both union and non-union home health aides will join fast food workers, big box employees, adjunct teachers, non-union construction workers, airport workers and other low-wage earners in rallies and strikes to demand the nation join cities like Seattle and San Francisco in raising the minimum wage to $15/hr. In New York, home health aides will rally at 4 p.m. at Central Park West near Columbus Circle, backed by George Gresham, head of the 1199 SEIU health care workers union. “Our sign for this march says ‘Invisible No More,’ Mr. Gresham told the NY Daily News. ” “We’re marching with union and nonunion health aides (because) so many of us rely on or are going to rely on the care these workers provide. We can’t ignore that they have needs, too.” He went on to say that many families are shocked to find out just how much their trusted home care aides make. But unlike fast food workers, or the employees of Walmart, the employees of quality home care agencies don’t see their bosses on the list of the highest paid CEOs. In fact, most home care agency owners are franchisees, and while profitable, they don’t make the top 10 most profitable franchises — those are primarily fast food restaurants and personal service franchises like SuperCuts and Anytime Fitness. Families primarily pay for homecare services out of pocket and are on already moderate or fixed incomes. High caregiver turnover means a disruption to senior care — care that is not a choice (like a hamburger), but a necessity. So what’s the answer to paying home healthcare aides like senior caregivers and CNAs more money without passing that cost on to the consumer? Many minimum wage workers supplement by utilizing public assistance in order to make ends meet. Can and should the government step in to supplement some of that hourly pay? We already know that senior home care is more cost-efficient than institutional care, like nursing home placement. The only way to keep great people in this demanding yet rewarding field is by paying them a living wage. Caregiver pay is typically more than the nation’s minimum wage, with 30% earning more than $7.25 per hour. But is it enough? According to Fight for $15, the answer is no. The fact that so many American workers need public assistance while still working a 40 hour week means that the system needs a change. Income inequality is at the basis of this fight. And in the U.S., that disparity is the worst in the world. What do you think is the answer? 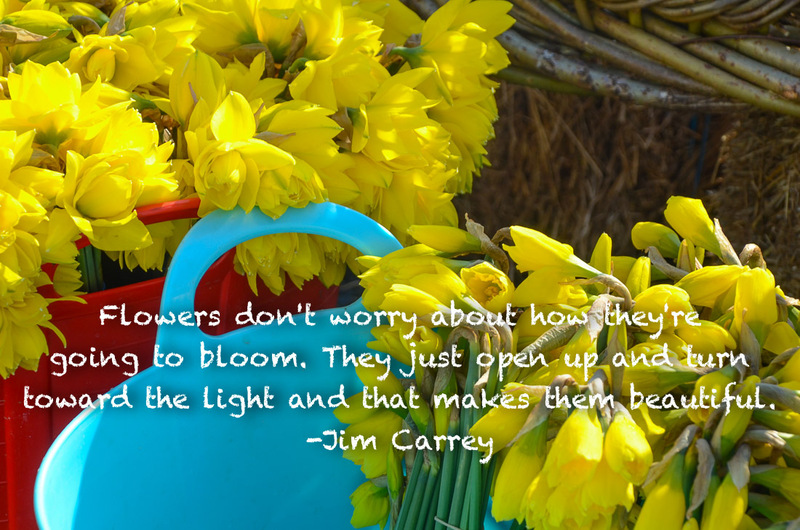 Daffodils are a sure sign that spring is in the air, and their bright color is so cheerful after a long winter. This week's stress relief photo was taken in St. Ives, Cornwall, in England. Please enjoy and feel free to share it with loved ones. Caregivers provide companionship to seniors, as well as caregiving and caregivers must remember to "care for the caregiver." Thank you caregivers and certified nursing aides for your hard work and caring for our seniors. Have a great week. Sto lat, they sing in Poland for your birthday. One hundred years, one hundred years — may you live one hundred years! What I once thought a crazy birthday wish is closer to becoming reality, especially if you are a woman living in one of the world’s developed countries like Japan or the U.S. In Michigan, 115-year-old Jeralean Talley takes the title for World’s Oldest Person. She became the oldest person in the world when 116-year-old Gertrude Weaver from Arkansas passed away early in April of pneumonia. Prior to that, a Japanese woman, Misao Okawa was the worlds oldest person. She died on April 1, 2015 at 117-years old. And although she lacks the paperwork to back her assertion, Mexico’s Leandra Becerra Lumbreras claims to be 127 years old. Life expectancy is increasing around the world due to improved health care (including immunizations,) sanitation, access to clean running water, better nutrition, and avoiding behaviors that are known to increase rates of mortality, such as smoking. But there’s a difference between reaching the average life expectancy in the U.S. (about 80) and becoming a supercentenarian (anyone who has been validated to have lived to be 110 years or older) — about 30 years. The Gerontology Research Group at the University of California, Los Angeles tracks supercentenarians around the world and, as of their last update on April 6 (as of this writing), 52 people (50 women, 2 men) are over the 110 year mark. There are many who claim to be just as old or older than Ms. Talley, but there’s no documentation to prove their birth date. There is, of course, a difference between living a long life and having a long life worth living. These extraordinary thing about the supercentenarians I’ve researched is that they all seem to be pretty healthy and happy, with sharp minds and disease-free bodies. Thomas Perls, is a professor of medicine and the director of the New England Centenarian Study at Boston Medical Center, the largest study of centenarians worldwide. Their studies show that a combination of genes and a healthy lifestyle contributes to aging well. They have found that among supercentenarians, health span = lifespan. They write that they believe that instead of the aging myth “the older you get the sicker you get”, it is much more the case of “the older you get, the healthier you’ve been”. So let’s get the long-life tips right from the sources. Here’s what the three oldest living people say have contributed to their long life. "It's coming from above," she told the Detroit Free Press. "That's the best advice I can give you. It's not in my hands or your hands." She also credits her long life to living by the golden rule. “I don’t have a secret,” Ms. Mushatt Jones told Time magazine. “Believe in the Lord.” And while she never drank or smoked, she eats four strips of bacon every morning, followed by scrambled eggs and grits, and gets at least 10 hours of sleep each night. Ms. Morano-Martinuzzi claims eating raw eggs and avoiding men has kept her young. Of course, studies show that longevity runs in families, and if your parents lived to be 100, chances are that you will too, as will your siblings and your children. Personally, I’ll be happy to test the daily bacon theory. Do you know any long-lifers? What are their secrets?